What is Fairy Dust? It's a closely guarded secret... some say it's the vapour trails of fairies flying fast, others that it's the remains of magic once it's used. Whatever it's made from, it's incredibly sparkly- the most amazing glitter, in special colours only available in this form. Wear it on your face or body (it's cosmetically safe), add it to wet nail varnish for super sparkly nails, or simply sprinkle it with abandon to spread joy- Fairy Dust is versatile and desirable. Wholesale Fairy Dust: If you're a shop, and would like to stock Fairy Dust, please contact us- we produce it here in the UK and it's available in a wide range of colours, both in biodegradable and non bio forms. Our Fairy Dust glitter conforms to the current UK cosmetic regulations and is a trademarked product. 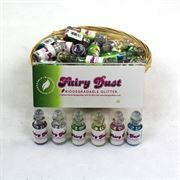 Our NEW Biodegradable Fairy Dust offers all the sparkle of our standard Fairy Dust without any cost to the planet. Marine biodegradable to OK Home compost standards, our glitter will disappear almost completely within 3 months of contact with soil or water. It's available currently in 6 different colours. We'll add more colours to the range over the coming months. Are you a retailer looking to stock Fairy Dust? We supply wholesale biodegradable Fairy Dust to independent retailers in the UK and Europe. Please contact us for more information.